With its romantic past as a haven for pirates and bootleggers, the Bahamas evokes a wild and natural getaway although today with a decidedly modern flair for fun and comfort — as the island annually cater to 4 million tourists who are seeking their piece of paradise. Of the more than 700 islands that make up the Bahamas - stretching for miles off the Florida coast to Cuba - the best known among tourists are New Providence, Grand Bahama, Bimini, Cat Island and Eleuthera. And perhaps the most familiar of these is New Providence, where Nassau is the main port o' call, a colorful jumble of English colonial architecture, mud and thatched roof shanties, and wood houses painted in bright pastels. 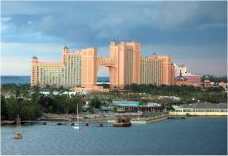 Then there are the modern mega-hotels, the most notable of which is the Atlantis resort and casino located on nearby Paradise Island. More world-class amenities await in Freeport on Grand Bahama, the chain's largest island, offering the best of modern amenities and exotic adventure including casinos and a hopping nightlife, as well as day trips out to the countryside to take in the breathtaking flora and fauna of Lucayan National Park. Elsewhere around the Bahamas, miles of white or pink sandy beaches are available for swimming, diving, or snorkeling around underwater reefs, or just for getting away from it all. During the height of summer, celebrations are the order of the day as the islands commemorate gaining their independence in 1973 from Great Britain on July 7, Bahamian Independence Day. If you're traveling near the end of December, also don't miss the wild and colorful New Year Junkanoo parades (the most spectacular occurring on Bay Street in Nassau) as the Bahamas kicks off its version of Carnival. The Islands of the Bahamas - The official site, with all you need to know for planning, booking and enjoying your trip to and around the Bahamas, with facts & information on major attractions, shopping & restaurants plus special looks at Nassau, Grand Bahama and Paradise Island, family fun, wedding planning, day trips, diving, snorkeling and off-beat activities. Bahamas Travel Information - Lonely Planet guide with insider looks at the top attractions in the Biminis, Nassau, Long Island and national parks, typical costs, practical info on getting there and getting around, weather facts, and visitor suggestions in the online forum. Bahamas Vacation Guide - The go-to place for dozens of detailed maps of the islands plus photos and travel tips, information on major attractions and beaches in Bimini, Nassau, Paradise Islands and more, with passport and entry requirements, interesting history & folklore, recipes, fun facts. Bahamas travel guide - Good overview from Wikitravel with typical costs, getting around by plane, bus or car, historical notes and weather facts, related links. Bahamas Tourist Guide - Go virtual island-hopping via a clickable map, learn more about where to go and what to do, practical tips on air travel and transportation, interesting historical and cultural guides, suggested reading and related links.